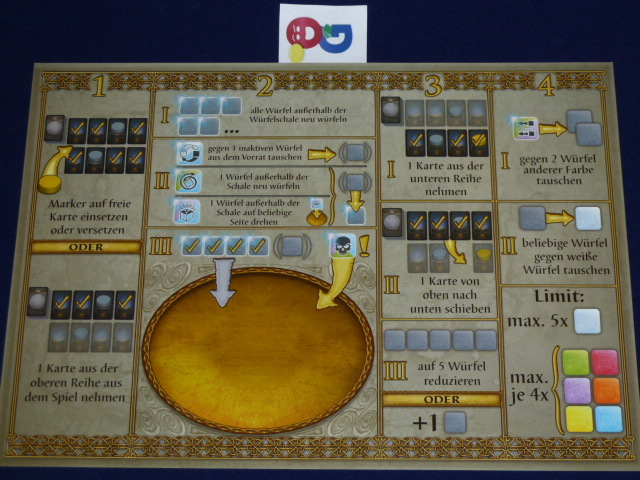 This week’s reviews look at the conjugation of dice games from Essen 2014. There are a good number of dice games this year – and I’m slowly but surely making my way through that stack. I will start the reviews this year with the games most similarly named. Each uses a bunch of dice in different ways to achieve fun. Ciub is a very interesting game that uses 7 different types of dice and a touch of deckbuilding to create a unique completed product. The goal of the game is to roll dice to get certain combinations of numbers that match up with those printed on victory point cards. There are 7 different colors of dice, and each color has a different assortment of numerical values and special abilities. 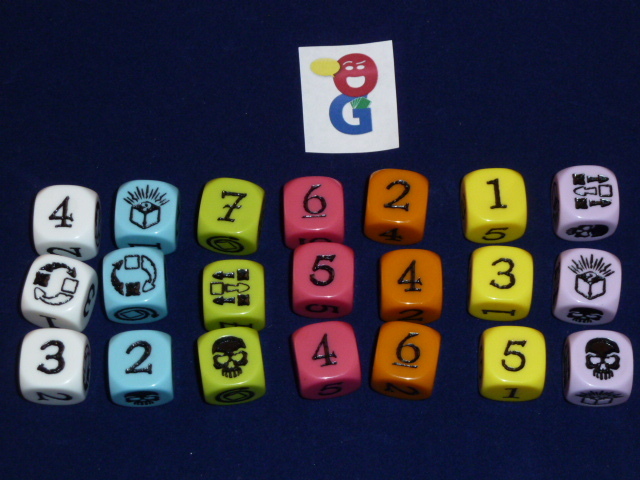 At the start of the game, each player has 5 white dice. These white dice have the numbers 1 thru 4 and two swap actions (more on this later). 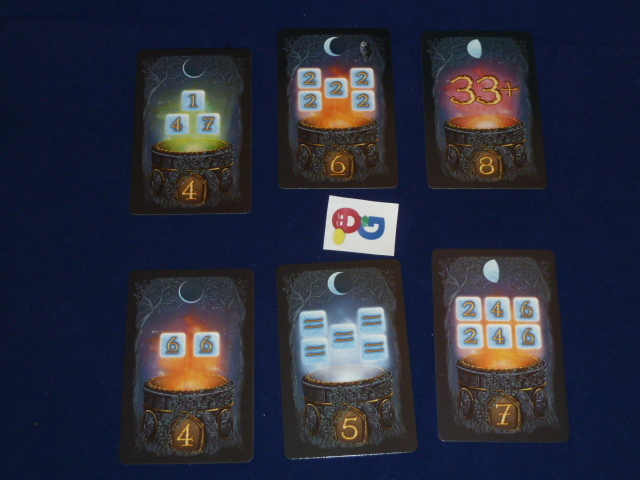 The tableau of victory point cards is set up with two rows of five cards. The bottom-most row of cards are those which are generally available for collection. The upper row cannot be collected just yet, but these are the cards that will soon move into the bottom row – so you can use them to plan ahead. On your turn, you go through 4 phases. Each player has one wooden disc that they can use. In this first phase, you can use your token by placing it onto any face up VP card (which has not yet been claimed by any other player). If your token is already on a card, you may move it to a different card. By marking it, nobody else may claim this card nor can they discard it. If you choose not to play or move your token, you may instead discard any unclaimed card from either row of the tableau. You are not obligated to do either of these actions. Take whatever dice you have in front of you and roll them – once rolled, they are considered active dice. If you want, you can put aside any dice you want onto your player board. If you do this, you cannot do anything to these dice for the rest of the rolling phase. Re-roll (green, blue): re-roll any one die. It could cause itself to re-roll. 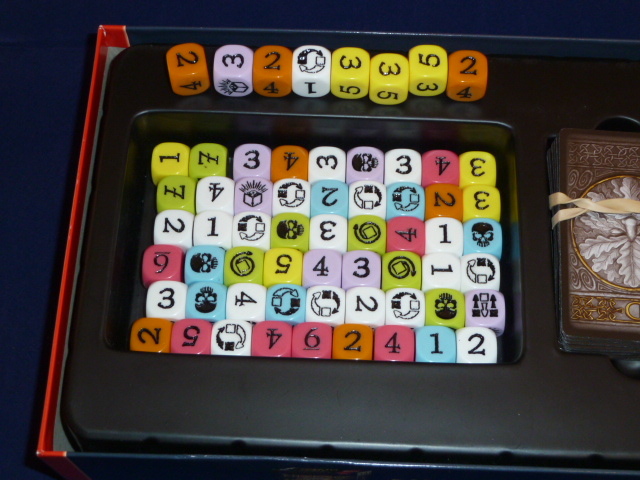 You can also use this to roll inactive dice. Skull (purple, blue, green): this face doesn’t really do anything. But any skulls have to be put aside onto the player mat at the end of the roll. With each roll, you must put at least one die aside onto your player mat OR have done at least one swap die action. After all your dice actions are complete, if you still have dice available, you can then re-roll all of them and do the dice actions again. You continue this process until you have placed all your dice onto your player mat. Look at the dice on your player mat and see if you match the pattern on any BOTTOM ROW unclaimed VP card or a VP card that you have claimed with your marker (again, on the bottom row). If you match, then you can collect the VP card! You are only allowed to collect 1 VP card per turn. A final type requires that your numbers sum up to at least a target number. If you are able to collect a card from the bottom row, you can then choose any card from the top row (which could be marked with any player’s marker) and move it to the bottom row. A new VP card is drawn from the deck to fill in the top row. Furthermore, if you have collected a VP card, you now must discard all but 5 of your dice. If you were not able to collect a card from the table, you keep all of your dice AND you are allowed to select any one other die from the supply to add to your group. In this final phase, you can try to set up your dice for the next round. First, you use any dice in your tray which show the “2 for 1” icon. You can trade each of these dice in for any two dice from the supply as long as they are not the same color as the die being traded in. After this, you can then trade in any of your colored dice for white dice. However, there are two important limitations in this phase. First, you may not end this phase with more than 5 white dice. Additionally, you may not have more than 4 dice of any non-white color. Once you do this, the next player can take his turn. The game continues until the penultimate VP card from the supply is revealed. At this time, there will be one card left in the deck – and this is always the same – a 5VP Magnum Opus card. The next player to collect any VP card will also get the 5VP Opus card as a reward. When this happens, that player’s game is over. All other players can take one more turn before the game ends. In this final turn, you skip Phase 1 (no more discarding cards nor claiming new cards) and you are allowed to collect any VP card on the table – not just those on the bottom row. After this final round, you add up the VPs on your cards – and the player with the most points wins. If there is a tie, the player with the most dice available wins. 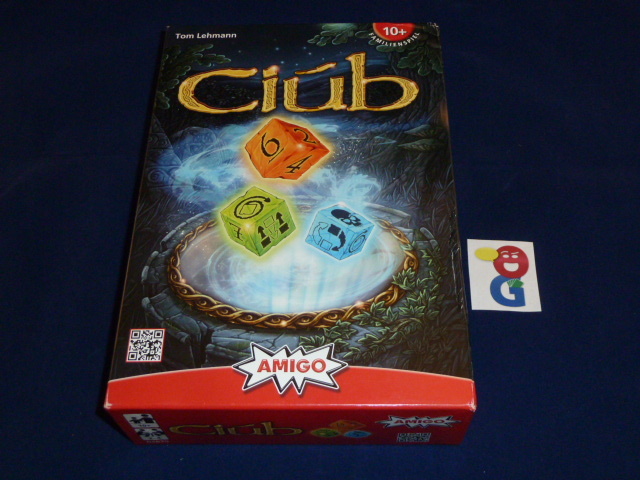 I have found Ciub to be a very challenging dice game, and one that has been fun to explore. The basic conceit of rolling dice to match VP cards has been seen tons of times. The difference here is that you really get to play with the dice each turn with the dice actions. Oftentimes, the key to success in a given turn is having the right dice to roll. Some of this work can be done in a previous turn with the 2-for-1 swaps but other changes have to wait until the current turn as you roll “swap die” actions. This manipulation reminds of deckbuilding, though it is definitely not as pervasive, so those who hate Dominion and similar games will not be turned off by this. Each of the colored dice has a different pattern of numbers and actions, and you should pay attention to what you might roll to help you choose the right dice. If you need odd numbers, then you should really look to get yellow dice into your pool (1, 1, 3, 3, 5, 5). If you must have a 7, then you need to roll green dice, as they are the only color to have them. Knowing which cards could possibly be on offer for your next turn (or which card you have reserved for yourself) gives you some interesting decisions at the end of your current turn. Do you try to trade for colored dice you’ll need in the coming round? Or maybe you switch back to white dice to hopefully swap for the ones you want. There does seem to be a bit of luck in the timing of who gets the 5VP bonus card, but in a dice game – luck is just an expected part of the deal for me. I suppose that you might be able to somewhat manipulate the deck by deciding when to discard (or not discard) a VP card from the display, but in the end, it’s hard to know when people are going to be able to collect VP cards. There isn’t much to do when it’s not your turn, so there is a bit of downtime, especially with 4 players. Some of the turns can get a bit lengthy, especially if someone has a lot of dice actions that allow them to continually re-roll the dice – normally you have to put aside one die each turn unless you are able to use a swap die action. However, with the whole game taking about 40-50 minutes, even if you only are actively participating in one fourth of the game, it’s still not more than 2-3 minutes between each turn. Get up, stretch your legs, get a drink, go to the bathroom, and you’ll be ready for action when your turn comes up. I liked it… but I found myself wanting to play To Court the King (also by Tom Lehman) instead. Does the Magnum Opus card overpower others’ chance of winning? I no longer have the game, but I don’t remember it being overpowering – but 5VP is a healthy enough reward that it is worth striving for!